Home Lake Hiking Trail in Vanderhoof, British Columbia, Canada is full day or a multi day wilderness hike exploring forests, lakes, creeks and meadows in the backcountry wilderness regions near the community. The year-round 12 kilometre trail provides overnight accommodations via a forestry cabin near Home Lake which caters to adventurers in every season. The main portion of the Home Lake Hiking Trail starts from Kluskus FSR (Forest Service Road) and leads to three main lakes and a modest wilderness cabin. 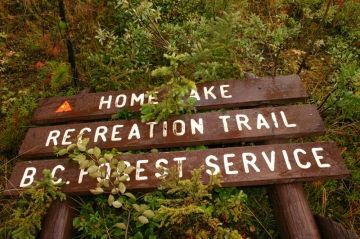 The entire long-haul Home Lake Trail starts from the gravel FSR and connects to the Kenney Dam FSR located northeast of the Greer Creek Recreational Campsite. The first section leading to Home Lake - the main lake - is approximately 4 kilometres long one way. The hike follows along a mix-match trail system crossing over tumbling creeks with some sections of the trail overgrown with grass while other sections follow an earthy single track pine-needle cushioned route. This portion of the trail is mostly easy grade hiking and should take no longer than 2 hours to complete one way. 2 kilometres after Home Lake there is a wilderness cabin and picnic area. The wilderness accommodation operates on a first come first serve basis and used year round. The short distance from the lake to the cabin should take no longer than hour to hike. For the long haul hikers the trail continues to a third lake which is named Paddle Lake. From the Home Lake trailhead to Paddle Lake should not be attempted in one day. This route is a multi day adventure. There is no cabin at this lake but there is some wilderness camping. Some backpackers decide to complete the whole multi day route ending at the Kenney Dam FSR. The entire route explores many more rivers and lakes like Crystal Lake. There is no cabins located after Home Lake. All backpackers should be prepared for wilderness camping conditions. 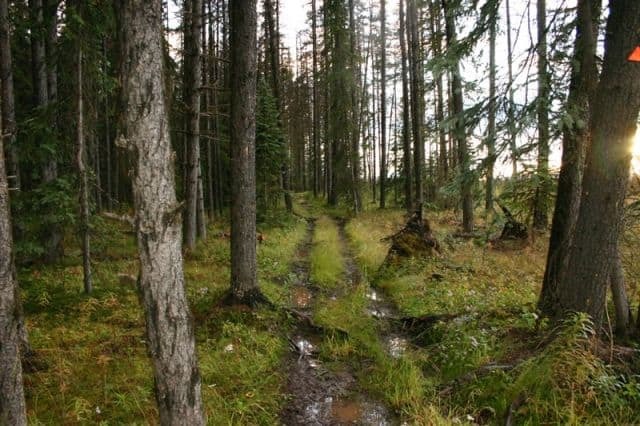 The trail is located in the deep backcountry region of Northern BC. And like most of the backcountry territory in this region there is plenty of wildlife to be seen. Some of the more popular sightings include Moose, Black Bears, Wolves and deer. During the summer the trail is used by hikers, horseback riders and by people who enjoy some time outdoors fishing. After the snow falls in the winter the trail is a popular destination for xc skiers and snowmobilers. How to Get Here: From Hwy 16 in the centre of Vanderhoof, BC, Canada turn onto the Kenney Dam Road and begin traveling west. The paved road will past Sai'kuz First Nation Village and follow the shores of Nulki Lake eventually turning into a gravel road. At the main intersection of the Kenney Dam, Kluskus and the Telegraph Forest Service Roads (FSR) turn onto Kluskus and continue to follow the signs. At about the 44 km point (27 mi.) a small gravel parking lot on the right will appear. There is a large Trail Marker sign hidden in the trees. Please sign the register at the trailhead. Park, sign in and hike.